After the weeks and weeks of working and coordinating the Kickstarter for EhL I was DONE with planning anything. I decided to skip camping and stay home to focus on relaxing, catching up on life and sleeping as much as possible. On Friday before the holiday weekend Mark sent an email with an itinerary of activities and asked if I wanted to join in. SOLD!! All the fun of hanging out with my friend without having to plan a thing! We had a fun filled day, here’s our adventure in bullet form! Visited Rusty’s house for some yard sale action. She used to do estate sales and had a little store so she had cool stuff. Both Mark and I got metal traveling cake trays! 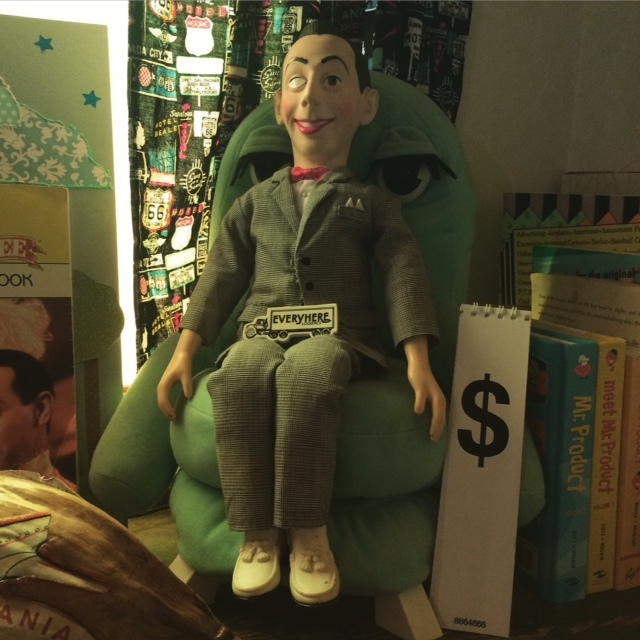 We got to peak into her super cute house and she had this cute little corner set up, hi Pee-wee! Got phở. Not exactly a traditional July 4th food, but so good. I love phở. Just so everyone knows. I also made a lot of bad puns, I just want to say I’m phở sorry. 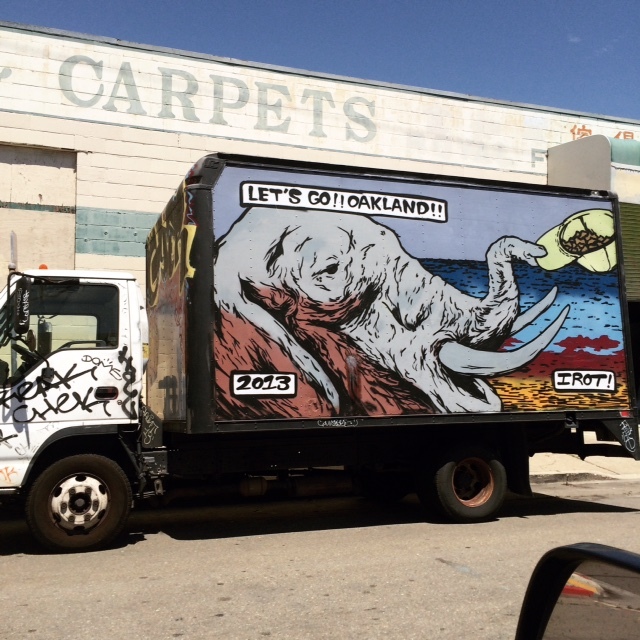 There was also a cool box truck nearby. Went to a giant aquarium store to look at the fish and birds. Hit up our friends bbq. She has swings! 3 of them! Went to a demolition derby at the county fair. We missed most of it but what we saw was rad! Saw bunnies and fancy pigeons! FIREWORKS! I got lost because I stayed to look at the bunnies while Mark and Jayne went to look at the fireworks. They found me, whew. After this was all done we decided to skip the traffic on the bay bridge and took the meandering way home. This is all to say HAPPY SUMMER! When you live in San Francisco summers are around 60F and frequently foggy. It doesn’t feel like summer when you have to bring a scarf and a jacket every day. So getting out of SF proper and doing summer things, and driving around in the car all day, got me excited about what to listen to in the car! Mark got an audio recorder and has been experimenting with recording audio. It got me thinking about road trips and audio documentaries on spaces, places and the passage of time so that’s the theme for this week! Fugitive Waves by the Kitchen Sisters. This 2 part series documents the final years of Route 66. They use found sounds, audio recordings and interviews to weave together beautiful audio that really transports you back in time. Next up is a podcast from Australia called Soundproof. This first episode you should listen to is a travel around the globe in 86,400 Seconds and the next is called Acoustic Life of Sheds. And the final podcast I want to recommend is from a show called How Sound. This story called The Hitchhiker, where Scott Carrier hitchhikes across the country to pitch to NPR without knowing anyone. How Sound digs into the background behind radio stories. Enjoy listening to how the radio sausage gets made, and hear snippets from Scott Carriers work and the stories of his travels. Scott’s podcast Home of the Brave is also really great and frequently talks about travel and adventure. What are your favorite podcasts on the theme of spaces, places and the passage of time?